Urban Sketchers has become something like an iceberg. The visible portion that the world first sees is the one hundred correspondents who contribute to our main blog. 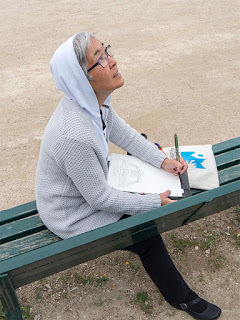 Their online work and the early books like Gabi Campanario's The Art of Urban Sketching: Drawing On Location Around The World created interest. That interest and excitement have been satisfied by the many Regional Chapters that have formed around the world. Our Regional Chapters are the huge hidden portion of the iceberg. The vision of Recording the World One Drawing at a Time is being fulfilled every day by our Regional Chapters. Urban Sketchers just did a big tally, making a list of all known chapters and a “head count.” We have 146 chapters and 89,410 chapter members! 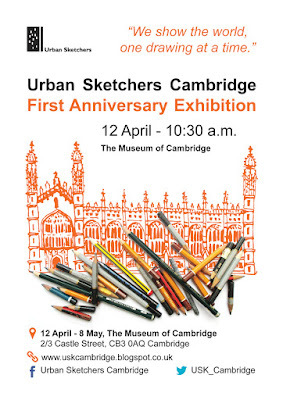 Add the 2,728 urban sketchers who do not belong to a chapter, and that's a lot of sketchers! 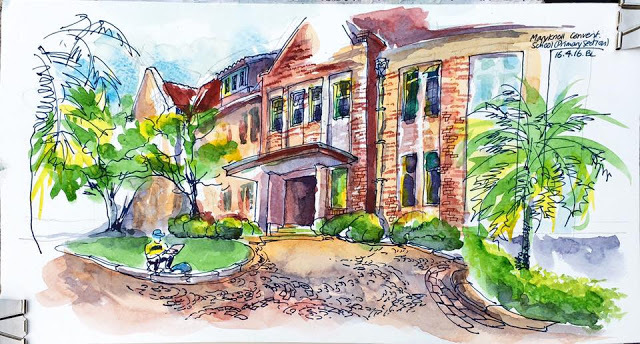 If your chapter is not already listed on our blog, please alert Regional Chapter Coordinator Mark Leibowitz (mark@urbansketchers.org), who will walk you through the process of getting listed. 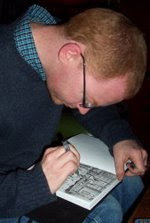 If you are a sketcher who does not belong to a chapter, you can list yourself on the Global Directory and use it to search for any other sketchers nearby. Do you think you missed out? You haven't: Symposium workshop passes are still available! Workshops are intimate learning experiences – we keep the number of participants small to allow for one-on-one interaction with instructors. Find more registration information, including the link to register, at the Symposium blog. Registration is open until May 27 (unless passes sell out before then). "Drawing People on Stage," a workshop by Isabel Carmona, Rolf Schroeter and Swasky, will be held May 27-29 in Brighton, UK. 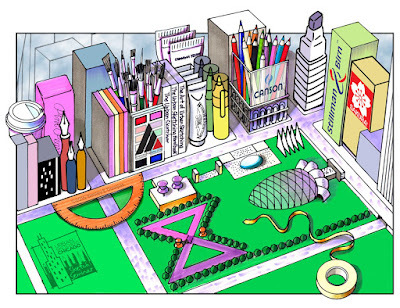 "Sketch it On Paris," a new workshop by Delphine Priollaud-Stoclet, Norberto Dorantes and Marion Rivolier, will be held July 20-23 in the city of lights. Another new workshop, "Nature/Sculpture," is offered by Simo Capecchi, Caroline Peyron and guest artist Majid Modir, Sept. 1-5, in Tuscany. 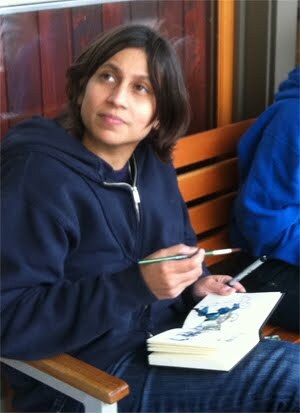 Put your sketch on the masthead of the Urban Sketchers blog! The masthead (flag) features a new sketch every two weeks. See the submittal guidelines, and send your flag to urbansketchers@gmail.com. Urban Sketchers now has an official YouTube channel. The channel broadcasts videos about USk-official workshops, symposiums, sketchcrawls, news and events; shares videos of official USk chapters; and educates viewers about the practice of on-location sketching. If you have created videos that meet these criteria and would like to contribute content, please contact Lydia Velarde at crzing@cox.net. Recently Urban Sketchers surveyed our mailing list of more than 2,300 subscribers. (Please subscribe to our mailing list to participate in upcoming surveys.) The survey was sent on Jan. 21, and 169 useable responses were collected after eight days. The feedback was mostly positive with some very helpful suggestions. The USk Executive Board carefully considered your responses and discussed how best to make the requested changes. Please read a summary of the survey responses with comments from the USk Board. Join us in Tacoma, Washington (USA), Aug. 19 - 21 for the 4th Annual West Coast Urban Sketchers Sketch Crawl. Local organizer Frances Buckmaster and other volunteers have put together an event that participants will long remember as one great sketchcrawl. Please RSVP if you plan to attend. 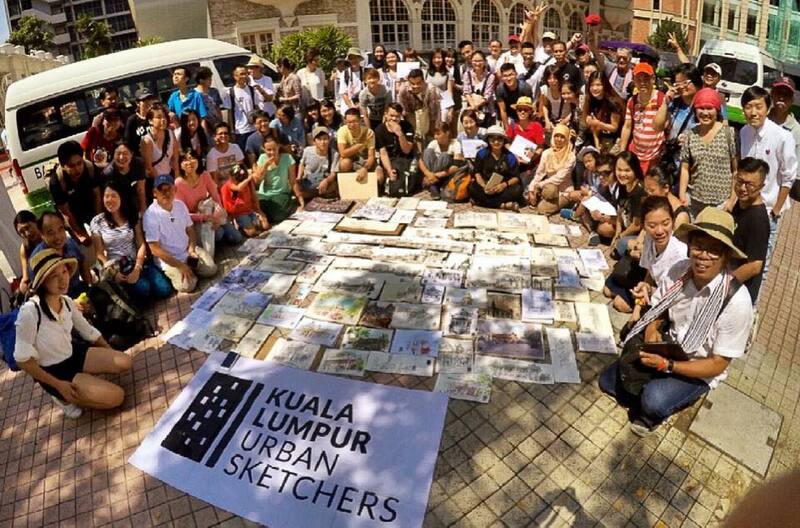 Joey Kher is excited to announce that Urban Sketchers Batu Pahat (Malaysia) is now official. "Many call Batu Pahat a cultural desert," said Joey. "However, Batu Pahat has a lot of beautiful corners to be discovered, and we wish to use our sketches to introduce the city and make it a better place to stay." Another brand-new group is USk Lanzarote, on the Canary Islands (photo at top of page). "We held an exhibition (where the USK manifesto had a prominent place) explaining what we do and sharing our sketches," said Eva de Urioste. "New people have joined afterwards; we even sketched inside the gallery. Some of the tourists who visited our exhibition were so enthusiastic that they wanted to find the nearest chapter to their hometown. A gratifying experience!" Johannesburg, South Africa, is "thrilled to at last officially be a part of the greater Urban Sketchers community, though we've been with you in spirit for quite a long time," said Cathy Gatland. The group has been meeting unofficially and growing since 2010. "Just about every time we go out we discover something new and interesting about our city and its people – I certainly feel as if I only started to get to know it after I began sketching as an Urban Sketchers correspondent," Cathy said. After years of sketching together, USk Johannesburg is finally official! 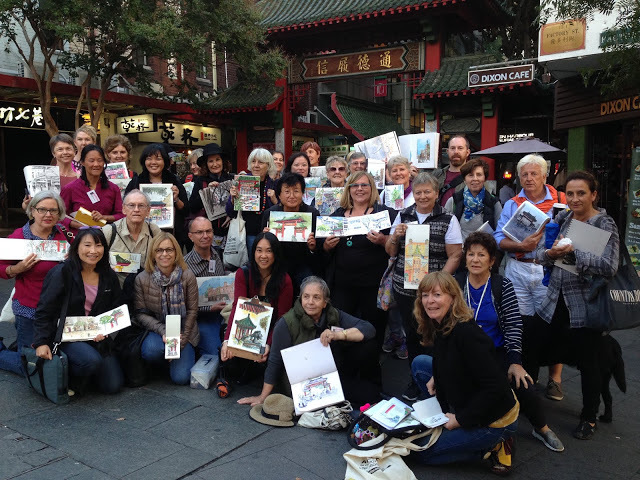 Last month "USk Sydney invited sketchers from around Australia to our wonderful city for a weekend of sketching," said Chris Haldane. "We had over 50 participants, 21 of whom came from as far away as Cairns and Adelaide. 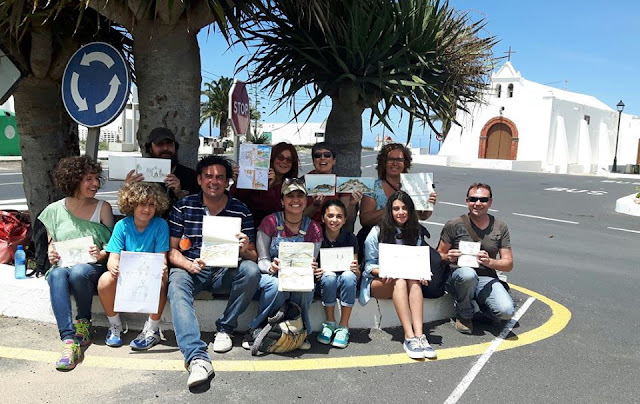 We sketched a real variety of locations, from the beach to convict sites to 21st century architecture, and of course there was plenty of chatting, eating and getting to know a lot of new friends from across our vast country." Urban sketchers from all over Australia sketch in Sydney's Chinatown. Urban Sketchers Ottawa sketched at the Canada Agriculture and Food Museum last month, said Cindi Moynahan-Foreman. "We chose Sunday because on Saturday there were lots of activities scheduled and we wanted to miss the crowds," Cindi said. "Not a chance! The weather was beautiful and the farm was packed! That added to the fun!" Sue Smith reports that Urban Sketchers Cambridge (UK) is celebrating its first anniversary with an exhibition at the Museum of Cambridge. Cabinets, windows and display cases are filled with sketchbooks and prints. The show is on through May 8. 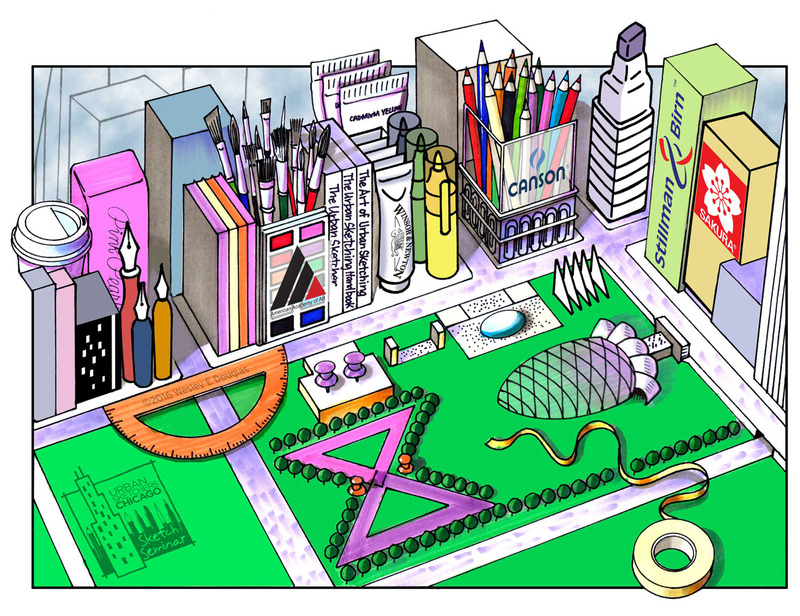 The third annual Chicago Sketch Seminar is now open for registration for the July 9-10 event. Visit the event blog to register and for all event information, including pricing information. Membership to Urban Sketchers Chicago not required. All are welcome! Kuala Lumpur (Malaysia) USk held a Kuala Lumpur City Gallery sketchcrawl in March with USk Taiwan, USk Penang and USk Ipoh, said Sheanne Lee. More than 80 sketchers participated. Ch’ng Kiah Kiean of USk Penang, Professor Chang Po Chou and Leo Li from USk Taiwan gave demos as part of the event. Local TV news gave the event coverage. The group's Facebook page has photos and sketches from the event. Urban sketchers at the Kuala Lumpur City Gallery sketchcrawl. 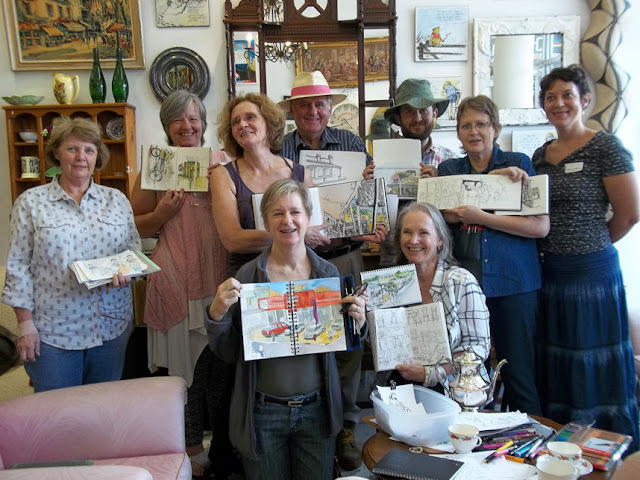 Paula Raudenbush of USk Fredericksburg (USA) said the group invited neighboring USk Charlottesville to join them for the 51st World Wide SketchCrawl April 23. 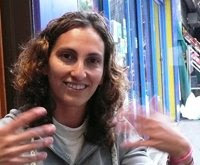 "I really like the idea of joining forces when we can and look forward to doing more of it," Paula said. Urban Sketchers Montreal, in partnership with Heritage Montreal, is pleased to announce an exhibition planned for 2017 in honor of the 375th anniversary of the city of Montreal. "We would love to see visitors from out of town at any of our fourth Sunday sketching this summer and fall," said Marc Holmes, "and then they should watch for the call for entry in 2017 to collect the sketches!" See USk Montreal's blog for details. 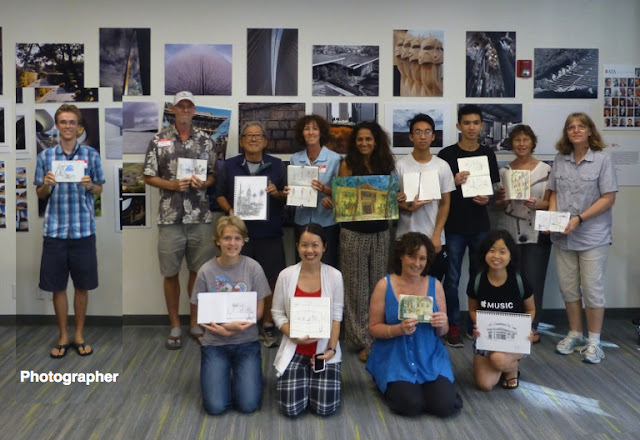 In celebration of Architecture Month, Urban Sketchers O‘ahu (USA) and the Honolulu chapter of the American Institute of Architects teamed up to present two sketch events in April. A mix of historical and modern buildings, downtown Honolulu provided an excellent setting to sample urban architecture from the 19th century to the present. Collaboration with the local AIA chapter greatly helped with setting up events and provided an opportunity to interact with professional and budding architects. "It was wonderful to learn how architects view these buildings," said Sebastian Sievert. "There is a lot more to it than proper perspective!" USk O'ahu and Honolulu AIA sketch architecture together. 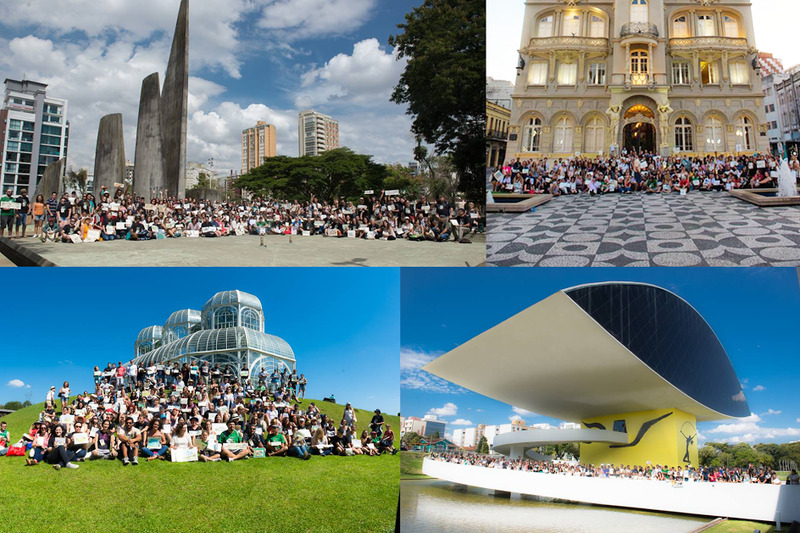 "After six months of planning and working hard, USk Curitiba and USk Brasil held our first meeting of Urban Sketching Brasil 2016 in the city of Curitiba," said Ronaldo Kurita. The 267 participants sketched six iconic points and their surroundings April 21-24. A great local team, Antonio Dias, Fabiano Vianna, Raro Oliveira, Simon Taylor and Thiago Salcedo, made the event possible, along with more than 30 partners who helped with promotions and donated giveaways, Ronaldo said. Four TV stations covered the event. Urban Sketchers Hong Kong sketched at the historic campus of Maryknoll Convent School in Kowloon Tong last month, reports Alvin Wong. During the show-and-tell session, members of USK Hong Kong and the school staff shared techniques and exchanged ideas on the many sketches produced there. This was the second year USk Hong Kong was invited to sketch at the school. 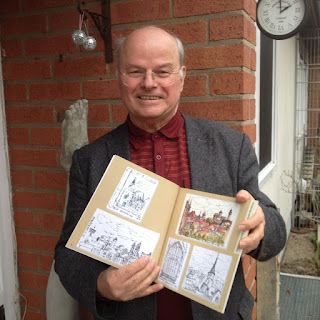 Manfred Scholz (Nuremberg) has just published a collection of his travel sketches from the past 25 years. 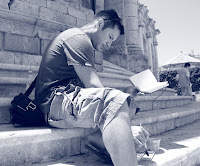 The book can be purchased by contacting drmanfred.scholz@t-online.de. See his sketches on Flickr. 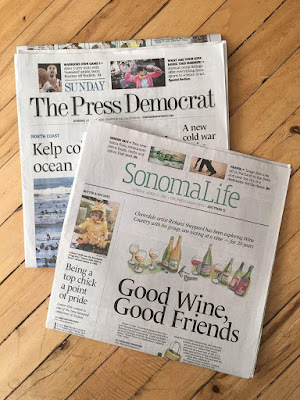 Richard Sheppard's book, Impressions of Wine Country, is being serialized in Sonoma County’s newspaper, The Press Democrat. The first installment was published April 17 and will continue monthly for the next 12 months. The book covers how wine is grown and crafted from the vine to the glass and includes more than 170 watercolor sketches. Richard Sheppard's book is being serialized by a Sonoma Co. newspaper. London urban sketcher Adebanji Alade was featured drawing on BBC's The One Show, the UK's primetime magazine program. 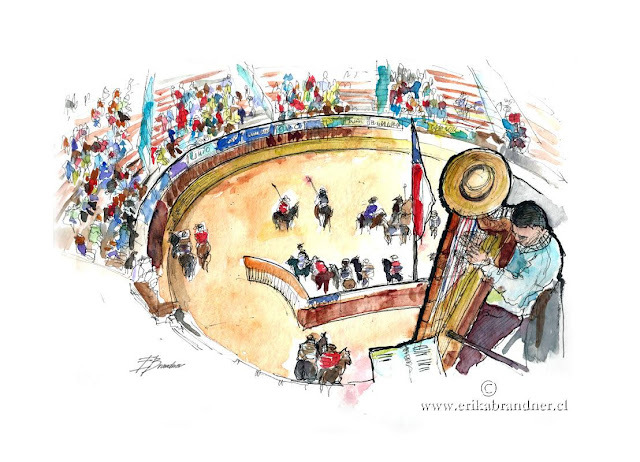 Erika Brandner was invited in April to sketch the Chilean “Rodeo" national championship, where she received national television coverage. Erika Brandner's sketch of a Chilean rodeo. San Francisco (USA) urban sketcher Laurie Wigham was featured in the San Francisco Curbed online publication about her exhibit last month at Sparks Arts. Called "The Changing City," her watercolor paintings exhibition highlighted construction sites in San Francisco. 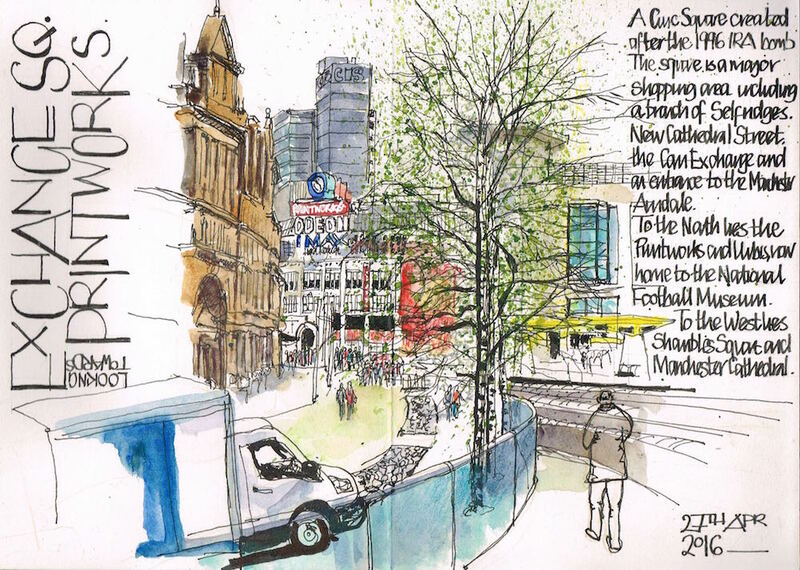 UK urban sketchers Lynne Chapman and Will Freeborn are both featured in the April edition of Artists & Illustrators magazine.